What Equipment Do You Need For Yoga? Actually you don’t need much to start doing yoga; I’d say you only need a good mat. That’s all. But… Sometimes, just to make the practice more convenient, or to enhance it, we can use various props and wear particular clothes. If you feel like having the mat only is not enough for you, then go on reading, since we’re going to dive into the most popular and needed yoga gear the majority of students use. You can consider it to be a kind of a yoga equipment checklist for beginners, or something. What Do You Need For a Yoga Class? 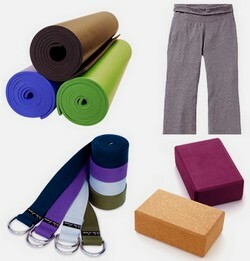 Among the things you need for yoga class a yoga mat is the most essential. Alternatively, you can have a blanket or a yoga towel, which is also popular in Hot or Bikram yoga. Yoga mats are made of various materials; the better the material is the more expensive the mat. The same is true for the mat’s size: if you want something bigger and thicker, you will have to pay more. But, there is no need to have a huge mat, because it will be difficult to carry it with you to a yoga studio. You can have it at home, of course, but still I think it is not always very practical. You need to get the right mat thickness, as for the size – just let it cover the whole area on the floor where your body lays. It’s great to have a natural, Eco friendly yoga mat, but such mats are usually quite expensive – can be over $40. As in the case with mats, the skidless yoga towels also come in various types, materials and prices. Sometimes, a quality towel costs more than a good mat. Now, although I said that there is no need to get a huge and expensive mat, it doesn’t mean you need to get a cheap trifle. No, a mat is essential and it will be with you during your practice for years! So get a really good one you like and feel comfortable to practice on it. Only a Mat? Oh, Wait! Actually, there is something else your mat needs: it is either a yoga mat bag or a carrying strap. You will need them to transport your mat to a class. A bag protects your mat from dust, but a strap is easy to use and fast to make your mat ready for the practice. 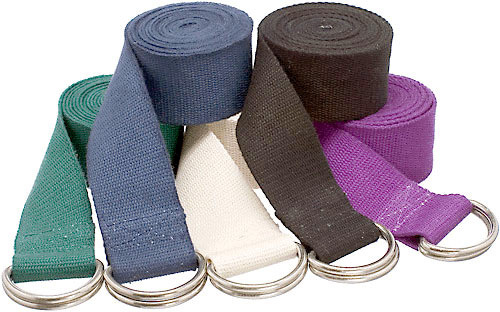 Some mat straps can also be used to aid your practice, which is an additional benefit. The next most important thing after the mat is the yoga apparel. The first thing to look at is the natural material like cotton or linen; also the clothes should be loose enough to allow free movement in various poses. Yoga practice involves flexibility and wide range motions, so make sure you get yoga pants and shirts to facilitate this. Instead of pants you may want to get leggings – they are fine as long as they are suitable for doing yoga poses. Instead of t-shirts you can have yoga tops, which often are pretty convenient. Some of them have built-in secure bras to provide an appropriate support for female students during their practice. The next are the yoga socks and gloves (or yoga paws). Actually I prefer to do yoga barefoot and with nothing on my hands. But if you are not into displaying these parts of your body, or it’s just a bit cold in the room you practice in, then you can get a special socks and gloves that provide an adequate grip. Also there are yoga shoes, which can be great to wear in a studio, especially during winter. Now is the turn for yoga props, namely straps and blocks. These are good for beginners, since the serve to provide “extra arms” and an additional support. “Extra arms” means that when you don’t have enough flexibility to do a pose, you can use a yoga strap to extend your arms. The similar thing is with the yoga blocks – for example, when you do the triangle pose (Trikonasana), and cannot reach the floor with your hand, you can have a block under it to place the palm over. Often these props are recommended for beginners since they not only compensate for your lack flexibility, but also provide extra safety. Other props include yoga bolsters or yoga pillows, bands, rollers, belts (the same or slightly different from the straps), yoga balls, sandbags. Basically, all these belong to so called ‘optional yoga equipment’. Is There Any Difference Between Yoga Equipment For Men And For Women? Not really; the major stuff is the same. The difference is in the apparel of course: pants, t-shirts, socks, etc. But when it comes to mats, straps, bolsters, blocks – all are the same. When you consider buying yoga supplies, start with the essential gear like a mat and clothes; if after a while you’ll feel like you need some more stuff to aid your practice, then go and get what’s required. But personally, I think there is no need to buy every piece of yoga gear at once. Chances are you won’t use all the things, some will be collecting dust. So start with the most essential yoga equipment for beginners, and proceed to get more if needed. I hope I made it clear about what you need to start yoga. The main thing, of course, is your desire to go on, and the ability to be regular and gradual in your practice. P.S. By the way, I completely forgot about doing yoga at home! If you practice at home, then consider buying the best yoga DVD for beginners!